"A lot of serious work goes into successful frivolity." Once upon a time Gabrielle "Coco" Chanel said, "We seem to forget that couture is a craft." 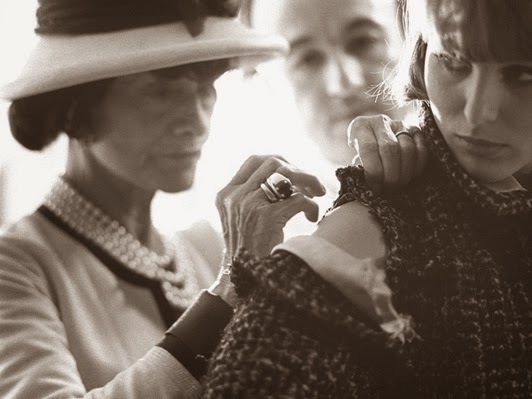 Unlike today, when a celebrity's name is attached to a fashion line to merely increase sales, Coco Chanel took pride in her craft of design and was a master tailor who understood a woman's body. She was such a perfectionist that she would spend countless hours fitting a sleeve and not stop until the fit was flawless. "The day before the show, I am capable of changing everything if a detail bothers me, or if I have the impression that everything is already out of date!" she said in 1959. Coco was always looking to the future of fashion and what would make a woman feel elegant and comfortable. Karl Lagerfeld, Chanel's creative director, has said, "Yes, the old Coco would have been shocked by a lot of things I did, but I had to do it, to keep the label in time with the times." It's a contradiction because Coco was nothing if not a modern woman. She suntanned and cut her hair short before either was popular and designed clothing that set trends for decades to come. Another obsession of Coco's was tweed. She fell in love with the versatile fabric in the 1920s because of its suppleness and how the mix of woven colors matched the skies and landscapes of England. Lagerfeld has incorporated tweed into many collections, including the one for spring 2014. Although he claimed that he's "not interested in history," Lagerfeld still includes many of the design details that Coco made famous, such as the camellia flower, suits, and decorative buttons. I purchased a plaid wool boucle with pops of color that would typically be used for a coat. Instead, I used it to make a dress that works perfectly for spring. I'd like to think Coco would approve.